The Sovereign's birthday is officially celebrated by the ceremony of Trooping the Colour (Queen's Birthday Parade). This impressive display of pageantry takes place on a Saturday in June by her personal troops, the Household Division, on Horse Guards Parade, with Her Majesty the Queen herself attending and taking the salute. Over 1400 officers and men are on parade, together with two hundred horses; over four hundred musicians from ten bands and corps of drums march and play as one. Some 113 words of command are given by the Officer in Command of the Parade. The parade route extends from Buckingham Palace along The Mall to Horse Guards Parade, Whitehall and back again. During the ceremony, The Queen is greeted by a Royal salute and carries out an inspection of the troops.After the massed bands have performed a musical 'troop', the escorted Regimental Colour is carried down the ranks.The Foot Guards and the Household Cavalry then march past Her Majesty, and The King's Troop, Royal Horse Artillery, rank past.The Queen rides in a carriage back to Buckingham Palace at the head of her Guards, before taking the salute at the Palace from a dais. The troops then return to barracks.Her Majesty then joins other members of the Royal Family on the palace balcony for a fly-past by the Royal Air Force. The first Trooping the Colour which is reviewed by The Major General usually takes place two weeks before the actual Birthday Parade. The second Trooping the Colour which is reviewed by The Colonel of the Regiment usually takes place a week before the actual Birthday Parade. Members of the public wishing to watch are advised to stand on The Mall or on the edge of St James's Park overlooking Horse Guards (their view may be somewhat obscured by troops in this position) from 9.00am. The best public vantage points are indicated on the map with black dotted lines. Events begin at approximately 10.00am, with the fly-past at 1.00pm. The parade is also broadcast live on the BBC in the UK. 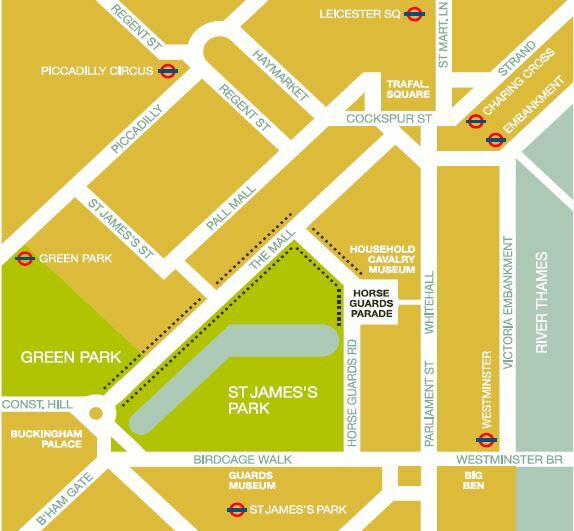 Tickets for seated stands around Horse Guards Parade for Trooping the Colour are allocated by ballot. Up to a maximum of 4 tickets can be applied. Ticket prices are as follows: £40.00 each for Trooping the Colour Reviewed by Her Majesty The Queen; £10.00 each for Trooping the Colour Reviewed by The Colonel of the Regiment and £5.00 each for Trooping the Colour Reviewed by The Major General. Tickets for the Colonel's Review and the Major General's Review are released for sale in January. Applications for Trooping the Colour are to be made between January and February only. Please go to qbp.army.mod.uk to purchase your tickets to the Major General's Review and the Colonel's Review or to go into the ballot for Trooping the Colour (Queen's Birthday Parade). For the Queen’s Birthday Parade only, access to Whitehall. On arrival at the junction Parliament Square/ Parliament Street, please have your QBP tickets ready for checking by the police/Household Division soldiers. 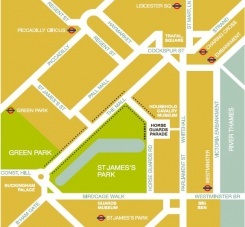 Vehicles will be allowed to drop off at Horse Guards entrance but not park. All vehicles will be directed to leave Whitehall via Horse Guards Avenue. Morning Dress, Lounge Dress, Lounge Suit or Jacket and Trousers, equivalent for the ladies (no denim). Military personnel may wear Ceremonial Day or other Service equivalent. Lounge Suit or Jacket and Trousers, equivalent for the ladies (no denim). Police will be conducting searches of your personal belongings. As a condition of entry any items such as knives, pen knives, Leatherman and similar articles are prohibited and may be confiscated.